When Sue Randell’s grandchildren wanted a puppy, she was the only person in a position to make their dreams come true. Having owned a pet dog years before, she knew only too well the joy a canine companion can bring. Now retired, Sue didn’t take much convincing that a puppy might fill her time nicely. 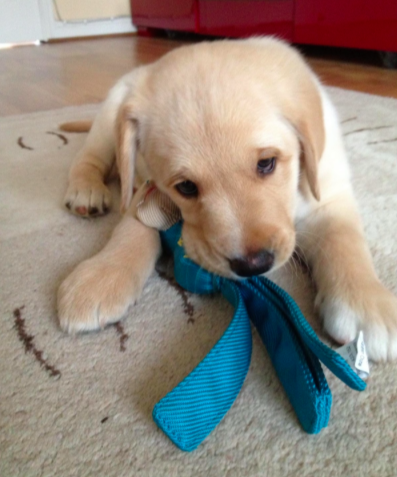 Within an hour, she had signed up to be a volunteer puppy socialiser with Dogs for Good. Not much of a dog lover, her husband agreed as they would only care for the dog for a year. This time became filled with moments that touched the hearts of all their family and many others besides; Sue’s husband was converted. When the difficult part came and the first puppy outgrew their services, Sue found courage from an unlikely source to let him go. Dogs for Good volunteers socialise puppies for the first year of their life, taking care of them in their own homes. They are the first people to really get to know our dogs and inspire them with confidence, ready for the day they start formal training to be an assistance dog or community dog. Sue’s first puppy to care for was Milton, pictured above. Milton ate through the Christmas lights twice, and chewed the table legs. BBC Points West ran a feature on Milton at a puppy training class and he became a local celebrity. Sue’s grandchildren introduced Milton to tug of war, hide and seek, and chase. He had his first trip to the beach and braved the British sea. As often as possible, Sue would take Milton to the school gates to drop off and collect her grandchildren. 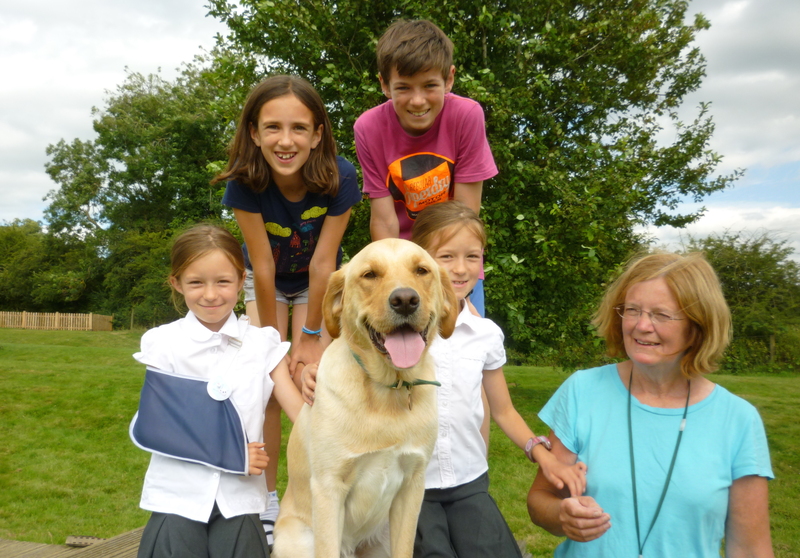 Pupils and teachers were intrigued by the incredible amount of life-saving skills an assistance dog can learn. “Unconsciously the children are passing the message on when they talk about the puppies they have,” says Sue. This all helps our cause. Over the course of the next year, Sue went on to make friends with other socialisers and dog walkers. Everywhere she went, people wanted to help with her tasks. Sue gave talks to groups of school children and helped the Brownie pack with badge work. Although it’s not a requirement, puppy socialisers often fall naturally into working as a registered speaker for the charity too, since their work attracts attention. You can become a registered speaker for Dogs for Good without being a puppy socialiser. But how do you give them back? Watching a puppy grow from a vulnerable ball of fluff into an independent dog, ready to train, is an incredibly special process. Undeniably, it is hard to let the dog go. This put everything into perspective. Knowing Milton would go on to change someone else’s life in an extraordinary way was all the family needed to appreciate the precious time they’d had with him. They encouraged his next steps. Sue has gone on to socialise more puppies, each time having a different experience with a different dog. Her dedication and that of all our volunteers is what continues to help Dogs for Good thrive, since we can’t continue our pioneering work without them. Are you interested in applying for this incredibly special animal job? See if you meet the criteria.